Alec Alec Mintjilmanganu is an Aboriginal Artist who painted depictions of Wandjina in the Kimberley of Western Australia. His bark paintings and paintings are some of the most enigmatic and haunting pieces of Aboriginal art ever made for commercial sale. 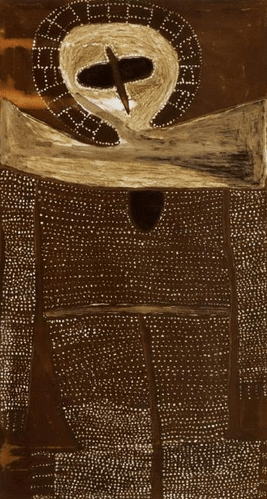 The aim of this article is to assist readers in identifying if their aboriginal bark painting is by Alec Mingelmanganu by comparing examples of his work. If you have a Alec Alec Mintjilmanganu painting to sell please contact me. If you just want to know what your bark painting is worth to me please feel free to send me a Jpeg because I would love to see it. 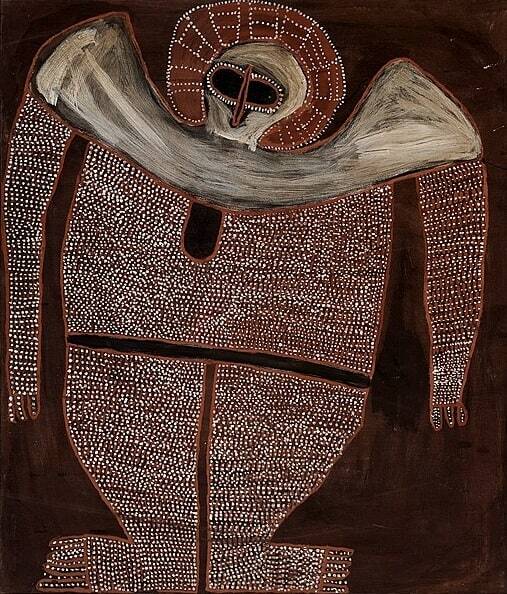 Alec Alec Mintjilmanganu’s images of Wandjina can be differentiated from many other artists by the way he depicts the eyes, as two base to base arches. These eyes are separated by a thin nose. Jack Karedada Wandjina have similar eyes but are much smaller. His figures have pointed shoulders higher than the neck. His bark paintings are on an arch-shaped piece of bark and not square. He usually depicts the full figure. His works are usually large and near life-sized when on canvass or board. Alec Alec Mintjilmanganu lived mainly in and around Kalumbaru in the Kimberleys in Western Australia. He began painting in the early 1970s. Most of his early paintings and some of the best examples of his work were on pieces of Bark and on composite board. He also painted some Aboriginal Woomera. In 1979 Alec Alec Mintjilmanganu did his first paintings on canvass. 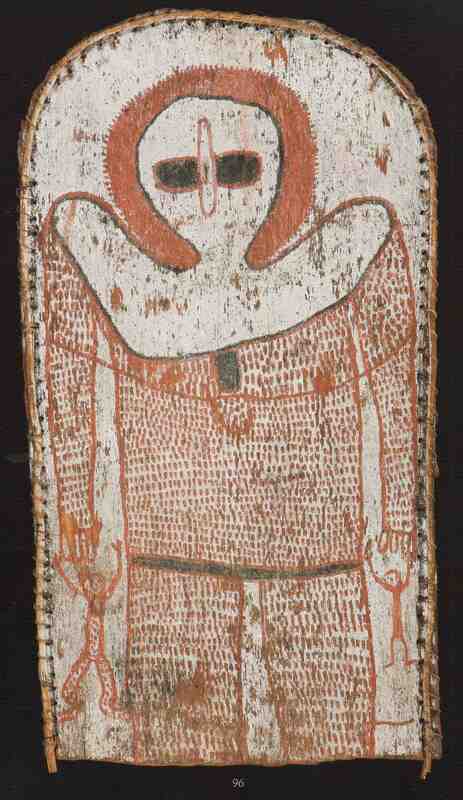 He also did a few smaller Wandjina on slate and although collectible these are not as desirable as his other paintings. Alec’s motivation to do Wandjina paintings was to encourage the continuation of cultural practices and religious beliefs. His works have a strong spiritual presence and are collectible. Alec Died in 1982. The following bark paintings are not a complete list of works but give a good feel for the variety and style of this artist.